I created this program in response to an ever increasing need for quality physical activity for children. I have witnessed an alarming decline in physical competence over the last 10 years working in the fitness industry in both young people and adults. According to the department of health in 2016, 1 in 4 children, 6 in 10 adults and 3 out of every 4 over the age of 50 are overweight or obese in Ireland. Movement competency and skill have been identified as major barriers to participation in physical activity(PA) and in turn is linked to being overweight. ‘Overweight boys and girls are more likely to possess lower levels of fundamental movement skills (FMS) compared to non-overweight i.e. those high in FMS proficiency are less are likely to be overweight’. Okely et al (2004). Children do not automatically develop in FMS so we must teach them. Drawing on the extensive research that has been done on fundamental movement skills around the world, this program delivers a syllabus to promote physical literacy and improve the physical education outcomes of children in Ireland. The following explains a little more about physical literacy and its importance in education. 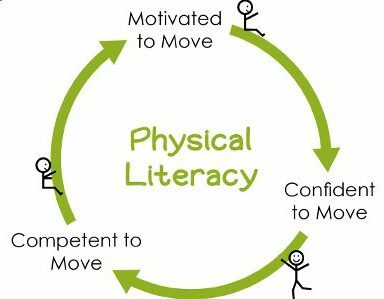 Like reading and arithmetic, which develop a literary or numerical vocabulary, physical literacy develops a “movement vocabulary” of fundamental movement skills and fundamental sport skills. Developing this physical competence is paramount to engagement in physical activity. What are the fundamental Movement Skills? Locomotive Skills– running, jumping, dodging, skipping, hopping, bounding. What are the Fundamental Sport Skills (FSS)? FSS’s are the skills that are more specific to actual sport. For example fielding a ball over head in Gaelic football. While passing and catching various size objects helps a child develop a foundation in object control skills, these skills can then be transferred into the more specific skill of fielding a ball over head. These specific skills should only be directly trained once a good level of competency is achieved in more general object control skills. Why is Physical Literacy important for primary school children? Physical literacy is unique to each individual and is particularly essential for young people to fulfil their physical potential. Enhanced physical literacy promotes heightened engagement in learning, which in turn enables the young person to achieve better outcomes. This is particularly the case for physical health and mental wellbeing, but has also been linked to improved academic achievement. At primary school stage of development there is what is called a “sensitive period” which is referred to as a broad time frame within which skills can be more easily acquired. This does not rule out acquisition at a later stage but may prove much more difficult and also discourage PA because of a lack of skill. Why is specialised physical education needed, don’t kids just naturally learn these skills or learn them playing sports? It is true that some of the locomotion skills can be developed from active play but because time in active play in children these days has dramatically reduced, even the basic locomotion skills are underdeveloped. “FMS mastery is believed to be a prerequisite for the development of sport specific skills” e.g. Wickstrom (1983), Thomas (1997) , De Oreo & Keogh (1980), Huabenstricker & Seefeldt (1986), Gallahue & Ozmun (2006), Haywood & Getchell (2011) FMS can be thought of as the building blocks of sport skills and without them children are at a serious disadvantage. This means that merely exposing children to multiple sports isn’t enough, they must be taught the fundamentals of movement first. Another reason to support the teaching of FMS is that both late and early developers can be disadvantaged by focusing on sport and competition over building the foundations of movement proficiency. For example early developers are generally at a great advantage in terms of strength, speed & power but may rely on these aspects rather than develop skill. In turn coaches tend to put them in key positions in team sports. Late developers feel discouraged and may give up participating and practising. However if these late developers continue honing their skills, once they catch up physically, they have an advantage over the early developers who relied on physical advantages and who didn’t develop their skill. These athletes are then likely to be discouraged when their previous advantage is taken away. Having a winning philosophy rather than a developmental philosophy does students a great disservice. Shouldn’t children just play and have fun? This is a common misconception about learning and fun. One of the major reasons for drop out in youth sport is that they are not competent in skills and are not learning skills. It is fun to learn and gain competency and is a major motivating factor for children when they improve a skill and are working toward mastery. Why can’t teachers just do this work? A lack of confidence in teaching PE. In an American study, Gagen & Getchell (2006) found that very few early childhood education programmes provide developmentally and instructionally appropriate motor skill interventions for children. What is the aim of the Physical ED. Physical Literacy Program? The program aims to develop the physical competence that is deemed appropriate at the various school grades. The long-term aspiration is for all young people to engage in daily physical activity, with increasing levels of intensity, to impact positively on their health and well-being.